"There's a saying among men, 'Marrying a woman is like buying a horse: I can ride you and beat you whenever I like.'" 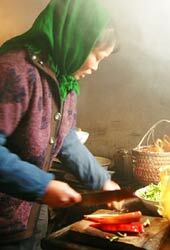 A woman prepares food for a New Year meal. China's women have always been under pressure: from men, from family, from work. Now more and more are under new pressure -- from themselves -- to take control of their lives; to get an education; to have a career; to marry for love. It's a slow, difficult process, and it is changing China. Mass migration from the countryside to the cities is increasing prosperity, but fracturing families. It also gives women new roles -- whether running the farm back home, or as wage-earners in the city. Xiao Zhang has lived in Beijing for 14 years, cooking and cleaning. This episode follows her home to her village 600 miles away for Chinese New Year, where she is reunited with the children she hasn't seen for a year. The cameras capture the visit of the local Birth Planning Officer to check on young wives, the plight of unwanted girl babies and abortion issues, and a village wedding which turns nasty. The film also explores the discrimination suffered by Xinjiang's Muslim women, the hardships of life in Tibet, and China's tragic suicide figures: China has one of the highest suicide rates for women in the world: 150,000 a year. One every four minutes.